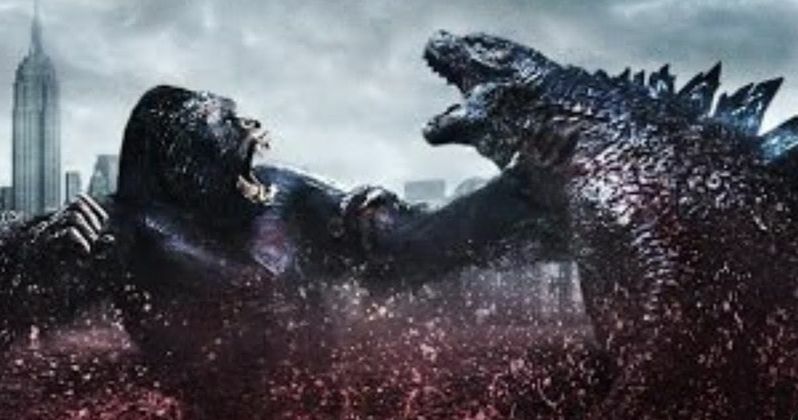 Last week, it was confirmed that there is a post-credit scene attached to Warner Bros.' Kong: Skull Island, which sets up the highly-anticipated Godzilla: King of Monsters in 2019, which will in turn set up Godzilla vs. Kong in 2020. As it turns out, it seems that scene was almost cut by the studio, according to director Jordan Vogt-Roberts. Here's what the filmmaker had to say in a recent interview about why it almost got the axe. "We shot that during production, and it was actually one of those things that they had taken off the movie at one point. For some reason, there was concern about it, and I was really happy when everyone decided let's bring this back. I think that's what people want to know is happening." During his interview with Cinema Blend, the filmmaker did not say why the scene was almost removed, but the scene made the final cut anyway. The scene features James (Tom Hiddleston) and Mason (Brie Larson) in an interrogation room with two-way mirrors, when Houston Brooks (Corey Hawkins) and Sam Ling (Jing Tian) enter the room and explain that they're at Monarch. They reveal that Skull Island wasn't the only thing they're monitoring, showing them footage of Godzilla from the 1950s along with cave drawings of Rodan, Mothra and King Ghidorah. In the spirit of its worldwide blockbuster Godzilla, Legendary Pictures presents a bold new take on the mythos of another iconic beast with Kong: Skull Island, which stars Tom Hiddleston (The Avengers and Thor series). Directed by Jordan Vogt-Roberts (The Kings of Summer) and written by John Gatins (Flight) and Max Borenstein (Godzilla), Kong: Skull Island will fully immerse audiences in the mysterious and dangerous home of the king of the apes as a team of explorers ventures deep inside the treacherous, primordial island. Legendary's story honors the foundations of existing King Kong lore, but places it in an entirely new, distinct timeline. Thomas Tull (Godzilla, The Dark Knight, Pacific Rim) and Jon Jashni (Godzilla, Warcraft) will produce and Alex Garcia (Godzilla) will executive produce. The film will be released in 3D and IMAX 3D by Universal Pictures. This post-credit scene that features the iconic monsters King Ghidorah, Mothra and Rodan will set up the sequel Godzilla: King of Monsters, arriving in theaters March 22, 2019. That movie will then set up the highly-anticipated Godzilla vs. Kong, which is slated for release on May 29, 2020. Kong: Skull Island opened big at the box office this weekend, performing much better than its projections with $61 million in its debut weekend.